The ComMuniCator, a magazine published four times a year by CMC, is a nationally recognized forum for mathematics educators. It discusses current issues, reports new developments, showcases innovative teaching and assessment techniques, and publicizes conferences, CMC services, and other professional opportunities. All CMC members receive this publication with their membership. Excel file of the ComMuniCator INDEX from December 1985 to June 2011. Jump to Data Sets for Problems associated with certain ComMuniCator articles. A note on the 2008-2009 ComMuniCator Special Conference Edition: Probability and Statistics Across the Grades. Like all of our annual special editions, this is not sent to members automatically. It is available at the conferences and by mail order (see order form below). One article this year, How Many Rolls?, has a third activity available as a PDF download. The TI programs given in the article can also be downloaded for uploading into your TI. Please see Data Sets for Problems for the links. Most years the editorial staff of CMC also produce a conference Special Edition. Unlike the ComMuniCator these issues consist entirely of classroom activities that have not previously appeared in our publications. These are not offered as part of membership, but are sold separately at each of the fall conferences and are available for purchase online. 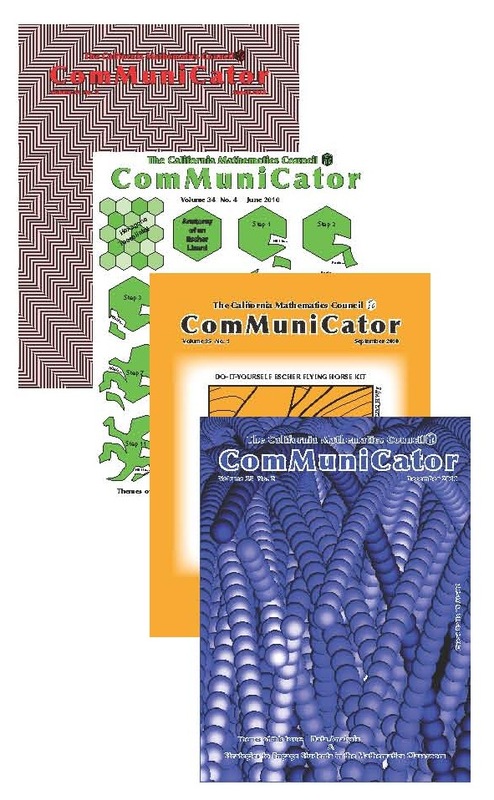 The ComMuniCator seeks articles on issues of interest to mathematics educators in California. Go to the Call for Articles and find out more. There’s a series in the ComMuniCator which is proving very helpful to parents and teachers. Written by the CMC Executive Board (the state officers and section presidents), it’s called “Have You Ever Wondered (About) …” (HYEWA).